BSN's main products include Personal Financing, Home Loans, Micro Financing, Premium Savings Certificate, Islamic Banking Schemes, GIRO Savings Account, BSN Matrix, Matrix-i Debit Card as well as VISA and Mastercard credit cards. BSN also provides wealth management services such as medical and hospitalization insurance and will writing. 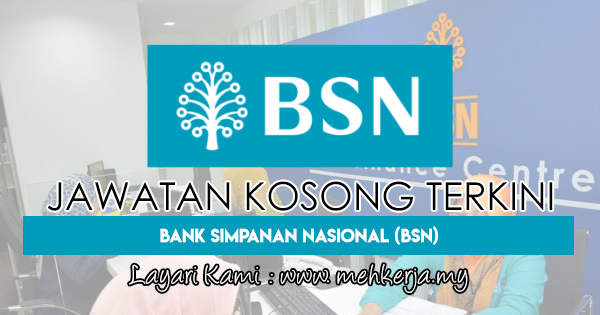 BSN was established on 1 December 1974 to take over the functions and responsibilities of the Post Office Savings Bank and is governed by the Bank Simpanan Nasional Act 1974 (“the Act”). BSN's mission is to encourage savings, investments and smart financial management among Malaysians to increase their quality of life. BSN has grown to more than 7,000 employees, 395 branches, 981 automatic teller machines (ATM) and 242 Cash Deposit Machines (CDM) and more than 1,500 authorized agents nationwide (March 2012). 0 Response to "Jawatan Kosong Terkini di Bank Simpanan Nasional - 2 May 2019"